Early-language development and 'closing the word gap'. Age-appropriate phonics: encouraging fidelity to a single systematic synthetic phonics programme and supporting the effective use of decodable books in the early stages of learning as a way of establishing phonic decoding. 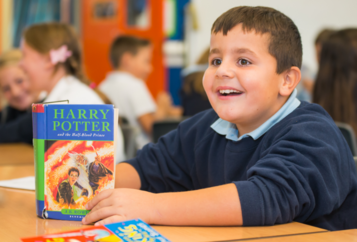 Promoting a love of reading through a focus on reading aloud, encouraging reading at home and developing teachers' knowledge of children's literature. You can begin by attending a Showcase Event at your local Hub school. You will then be invited to write an action plan to apply for funding and free bespoke support. In our area there are three English Hubs based in the region: Myland English Hub, New Wave English Hub and New Vision English Hub. Hub schools have been allocated a geographical area within the region. However, schools can choose to engage with any Hub school. Bringing science to school and making it cool! Accelerate Lead A1 Teaching Schools Alliance has been asked to be the delivery hub for the Cambridgeshire/Peterborough area for the new Accelerate Programme, which has been put together by the Education Development Trust and the Chartered College of Teaching. As you will be aware retention of teachers in year 1 to 5 is critical. The programme offers a FREE instructional coach over the course of a year for individual teachers. It is a bespoke programme that will be developed around each individual teacher’s needs. The whole programme will be quality assured by the Education Development Trust and the Chartered College of Teaching. There are a limited number of places, so to secure a place for any of your staff in Cambridgeshire it is essential that you move quickly. The free national teacher vacancy listing service is now being rolled out to schools across the country, with all schools expected to be invited by March 2019. We’d like to thanks all those schools who have already signed up and benefiting from this service. As you will know the busiest time of year for job moves is coming up as teachers and leaders consider their next career move. To assist you in this busy time we have provided the Department of Education with details of all our schools that don’t have a login so that you can all benefit from the service this year. They will be in contact soon with your login details. From January 2019, DfE is running a paid-for marketing campaign, aimed at teachers looking for their next teaching role. The campaign will run across social media, and DfE and stakeholder channels. Cambridgeshire schools who have signed up to the service will benefit from national visibility of their vacancies - not only from jobseekers visiting the Teaching Vacancies site, but through search results delivered, for example, by Google Jobs - all at no cost to the school. School employers are required to set the term dates of their school year. Employers are: the local authority in community, voluntary controlled and community special schools and maintained nursery schools; the governing body in foundation and voluntary aided schools; the academy trust in academies and Free Schools. The law regulating the school day and school year applies only to schools maintained by a local authority and special schools not maintained by a local authority. This law does not apply to academies and Free Schools. Schools must meet for at least 380 sessions or 190 days during any school year to educate their pupils. If a school is prevented from meeting for one or more sessions because of an unavoidable event, it should find a practical way of holding extra sessions. If it cannot find a practical way of doing this then it is not required to make up the lost sessions. As you can see from the guidance this does not ask the Local Authority to indicate dates for the additional 5 days for INSET and, given that there are now so many different types of schools that do not have to follow LA guidance, it was no longer considered necessary for us to do so. Disaggregation is to be discouraged however, the last paragraph could usefully be used to justify the setting of INSET dates during term time as long as the days used are made up so that pupils can access 190 teaching days in total and you notify all parents and stakeholders. A note is already on the LA website indicating that parents MUST check with their associated schools for clarification around specifics. When these set of dates went to consultation this time last year there were only 8 responses from schools and none brought this up as a problem so changes weren’t made. Going forward to 2020/2021 term dates the additional 5 days have been added in, given that it has caused so many issues for schools this time around. LGSS has commissioned Heart of England Training on behalf of our maintained schools to provide the Supporting Teaching and Learning in PE qualification (L3 Apprenticeship). This gives your school the potential to upskill existing Sports staff, bring in fresh talent as apprentices and reduce the cost of bringing in third party companies. This is an ideal opportunity to nurture talented sports focused individuals and have them delivering real sessions with the support of our dedicated training team. For more information on course content please use this link . If you are a maintained school that is interested in this opportunity please contact Paula Schofield in the first instance to discuss next steps. If you are academy, you can contract directly with Heart of England Learning. Thank you to the 70 schools that have responded to my email of 8 January about funding challenges and gathering evidence on the issue. The deadline is the end of the month – this a really good opportunity for our MPs to support us with the challenge that every school in the county is struggling with. The questions can be found here - https://www.smartsurvey.co.uk/s/8K6D2/ and I would really appreciate your response. If you have any questions, please let me know. Public Health England (PHE) scientists from the microbiology laboratories based at Addenbrooke’s Hospital are keen to visit schools as part of the Cambridge Science Festival in March 2019. 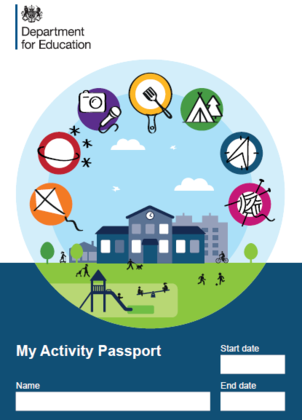 DfE has published a new resource for primary schools, the ‘Activity Passport’ – working with the National Trust, Girlguiding and Action for Children. The Activity Passport is a free checklist to help schools introduce pupils to a wide variety of new experiences to complement their day to day learning. Future Teaching Scholars are maths and physics specialists on a six-year teacher recruitment programme. They committed to teaching before commencing their undergraduate degree and have engaged in a structured programme of learning, which prepares them to teach and is delivered by Outstanding Teaching Schools, alongside their degree. The DfE is looking for schools to employ Scholars from September 2019. Schools will be required to fund the trainee teacher’s salary and the SCITT attached to the programme’s regional training centres provides the training. A supportive environment is essential and specific commitments will include releasing the Scholar to attend regular training sessions at one of the programme’s regional ITT providers and for the national conference. Subject to an eligibility check, any school with maths or physics teaching vacancies that can offer excellent support, can express their interest in employing a Scholar. There are only 50 Scholars available in September 2019. For more information and to register your interest, please visit Future Teaching Scholars. The DfE Teacher Workload Team is running a short series of focus groups to better understand school leader workload. This includes identifying the key burdens, and any unnecessary tasks which could be removed, to explore possible ways forward. The meetings will be in DfE offices and are open to all members of school senior leadership teams (one representative per school). Target Audience: This workshop is aimed at any teacher, coach or assistant in Key stage 1 and 2 who teaches Dance type activities. Target Audience: This course is ideal for Primary, Special and Secondary School teachers who teach Physical Education. Target Audience: This course is for NQTs and those teachers returning to the profession in the primary phase who want to develop their understanding of the National Curriculum of Physical Education, health and safety implications and how to deliver high quality PE. For school leaders. Wednesday 6 February, Wednesday 24 April, Wednesday 3 July. Cost £295 (free places provided for Opportunity Area Schools by the East Cambs and Fenland Opportunity Area). For school leaders (both Primary and Secondary). Wednesday 13 February, Wednesday 1 May, Wednesday 12 June 2019. Cost: £295 per delegate. Sessions to run from 10.00 to 14.00, £30 per head for half a day. Click the heading for more information. For teachers and TA’s, Thursday 7 February 2019 13.30 to 16.00, Winhills Primary Academy, St Neots. £60 per delegate. For KS1 and KS2 teachers, Tuesday 5 March 2019 and Tuesday 30 April 2019 13.30 to 16.00, Winhills Primary Academy, St Neots. £100 per delegate. Supporting staff to gain HLTA Status, Monday 20 May 2019 & Monday 24 June 2019, 09.00 to 15.30, Winhills Primary Academy, St Neots. £290 + VAT plus £450 for assessment per delegate. Wednesday 30 January 2019 & Tuesday 5 February 2019 – 09:15 – 16:00, Ambury House, Huntingdon. Monday 11 March 2019, 09.30 - 16.30 - Ambury House, Huntingdon. Wednesday 13 March 2019 – 09:15 - 16:00 - Cambridge Professional Development Centre, Trumpington.